Sepang was the future once. When the then-gleaming new venue from the pen of architect of choice Hermann Tilke arrived on the calendar in 1999 the great leap forward, leaving all existing hosts breathless, was conspicuous. 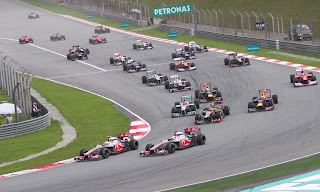 Bernie Ecclestone quickly hailed the facility for the inaugural (in the F1 World Championship at least) Malaysian Grand Prix as "the best in the world". And any F1 venue history will need to have this one as its fork in the road. Much of what is here became the template for the new Tilke-dromes that have popped up almost inexorably since. Not merely that it was Tilke's creation. Not merely either that it was built from scratch on a greenfield site it that familiar way. Nor that the architecture was giant, innovative and distinctive - here indeed the grandstand roofs are shaped like Hibiscus, Malaysia's national flower, something that even now still attracts many a camera lens. There also is a clear fingerprint with the circuit layout - a long straight book-ended by tight corners intended to provide overtaking opportunities (this track has at least two of them indeed), as well as a fair variety of types of turn including a high speed esses section. Even the motivation was the same as what was to become grimly familiar - the Malaysian Prime Minister of the time wanting to promote the country as an industrial and business destination and deciding to bankroll the round to this end. Perhaps this association with what's new explains why even though this weekend will be F1's visit number 18, Sepang still feels a lot like a Johnny-Come-Lately presence. But perhaps too it's related to that the round hasn't ever really gone anywhere. Its popularity varies. The track layout is a good one certainly and indeed it's often been the scene of entertaining, and unpredictable, races. But on the other hand again like many of the new rounds the local enthusiasm seems well under control - the cavernous grandstands usually are sparsely-populated and moreover there is a feeling (which also has been repeated with many subsequent venues) of it all being a top-down imposition rather than any sort of planting of genuine local motorsport seeds. Ann Bradshaw indeed once commented of the place that "when you go back to it for a race, you feel the staff have arrived the day before, opened the offices, chased the spiders away and said here we go again". Then there is the sapping intense local humidity that draws the life out of competitors and observers alike. But still, someone somewhere in the country must think it's all worth it, as the vast hosting fees continue to be paid, and as we know that in itself goes just about all of the way to guaranteeing that the event lives on. And it's appropriate that at a watershed venue for the sport, the feeling as we head to Malaysia this time is that the sport is experiencing a watershed of its own. As after Nico Rosberg's astonishing showing in Singapore last time out many now are wondering if they'd been wrong about him all of this time. And this has implications. The title battle has been close for a while between the two Mercedes pilots, on points at least, but many assumed for various reasons that Lewis Hamilton would almost inevitably win out somehow. Yet after what Nico did around the Marina Bay track plenty all of a sudden didn't feel so sure. On the face of it Sepang may be a good place for Lewis to bounce back. 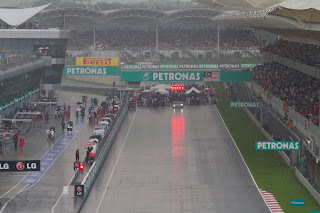 While geographically this one isn't far from Singapore, and shares the same humidity, otherwise the Sepang track could hardly be more different to the Marina Bay one just visited. Open, fast and flowing rather than tight, enclosed and claustrophobic. From one of the toughest to pass on to one of the most presentable. Even now however many efforts later this one may be Tilke's best layout. As noted it has much of the Tilke fingerprint but it has a good variety of corners and plenty of quick and challenging ones. Lewis can take more specific encouragement also from that he has finished ahead in every Sepang visit as Nico's team mate, which included 2014 when took his stable mate to the cleaners. By Morio - Own work, CC BY-SA 3.0, https://commons. That's not necessarily that however, as this track also - a bit like Singapore indeed - has long been deceptively happy hunting ground for Nico as well. One thinks of him sticking his Williams third on the grid here way back in 2006 in only his second Grand Prix, leading confidently in 2009 as well as in 2010 qualifying second and finishing third. It required a team order to keep him behind Lewis in 2013, plus as outlined we may have a new model Nico Rosberg with us right now. Topping it all off, Singapore was supposed to be de facto Lewis home patch too and look at how that one turned out. This is a venue where form doesn't necessarily count for a great deal though. It's one of those places where things, often on the unanticipated variety, happen somehow. We can reason why to an extent too. The run to the first turn is one of the longest on the calendar (we know also that the Mercs' starts have been variable this year) and awaiting there is a torturous right and left loop. After exiting it on lap one things can look very different to the grid order from a few seconds earlier; we tend to have a few without an intact front wing, four inflated tyres and the like. Then there are the notorious local flash rain storms which dump deluges on the track at little notice and often at inopportune moments on Saturday and Sunday; this can and has jumbled - and ruined - many a weekend. It's even caused a few red flags and the 2009 race was only half-completed. If it does appear though Lewis is thought to have the better ability to improvise, and indeed when rain did arrive in Q3 last year Lewis still bagged the pole while Nico wasn't able to even get onto the front row. Tyres represent a conundrum here and it may be particularly acute this time. The long, fast, high energy corners ask a lot of the rubber, as do the abrasive surface and high temperatures (track temperatures can reach 60C). And this year as ever the extra Pirelli compound brought is one 'softer' than usual as the soft is available in addition to the medium and hard of previous visits. 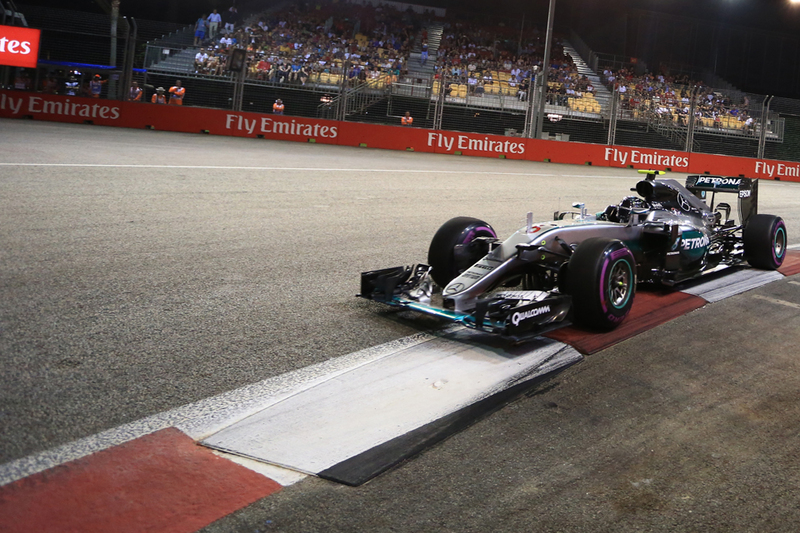 Last year many competitors (not least Mercedes) struggled to make even those compounds last and had to stop three times, and this time many of the top ten will be starting the race on the softs of course and may be seeking to ditch them early. In the 2015 race an early safety car forced a few hands but it was assumed by many teams that ten laps was the most that could be got out of the medium for the opening stint, so perhaps on the soft the opening halt will be even sooner. With the relative ease of overtaking and frequency of rain strategists aren't necessarily too fearful of making an extra stop, but last year's race demonstrated that there still is something to be said for track position. Adding to the confusion the Sepang track was resurfaced earlier this year (though the FIA insists problems experienced by MotoGP since have been sorted). There will be plenty of frantic calculations going on with tyres in Friday practice, and last year that running still provided a bum steer, when Merc ended the day thinking that hard tyres where the thing to have for the race, but in the event the medium was superior and Ferrari took full advantage. Another reason for Sepang's capacity to surprise is that it challenges reliability too. The high ambient temperature strains machinery as does that cars are at full throttle for a high proportion of the lap. This may not just be about the race either as we saw in Singapore that missing practice running due to breakages or else simply not getting the car handling to your liking on Friday can also impact who'll emerge on top when it matters. We've already outlined the importance of Friday running, and we are left to conclude that for all our attempts to predict which way this one will go, the cards falling either way on something like that, or something like who gets the better start, could go a long way to deciding whether Nico or Lewis is ahead this weekend. By Morio - Own work, CC BY-SA 4.0, https://commons. 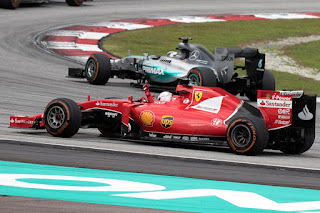 Last season, Singapore aside, Malaysia's was the Mercedes team's weakest weekend, as it seriously lost out to Ferrari on tyre longevity and strategy, leaving the silver pair to trail in somewhat gingerly behind Sebastian Vettel's victorious red machine in the race. Adding to the variation from the norm some cars have to 'open up' their cooling more than others, which can give unusual competitive orders. Word had it that last year Mercedes needed to open up its cooling more than the Scuderia too, and we often hear more generally that various Merc components are run marginally on temperature, a function apparently of being able to assume it'll run out front in clear air for the most part. With the long straights and quick turns however Mercedes should be well placed for qualifying at least, so without the unusual it should lock out the front row and be in a position to control the race. Last year though Seb sneaking onto the front row after the rain mentioned limited Merc's options. As for where any threat to Merc may come from, we can start with its vanquisher last year, Ferrari. The Scuderia has had a mini-upturn in recent weeks and is bringing an aero upgrade to Sepang too. But in Singapore we saw that with it the team still rather persistently gets it wrong on strategy. 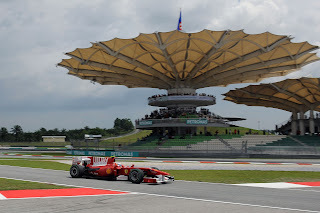 It's not just because of the calendar shift of the Malaysian round from a March to October date this time that Ferrari's strategic triumph in the last Sepang visit seems like a long time ago. With Red Bull, while the RB12 will most probably be untouchable through the variety of turns the long straights will be regrettable. Unlike Ferrari it doesn't necessarily have better tyre life than Mercedes to benefit from, though it did look a little better on that front than the Merc in Singapore. It's hard to envisage a threat to the big three teams either. The Toro Rosso chassis will look good in the quick stuff but will probably struggle on the straights. Williams and Force India will perhaps be that in reverse. McLaren meanwhile may have an engine upgrade and if so will be worth watching on the stopwatch, yet on the flipside it'd likely be starting the race at the back due to the resultant engine penalties (allowing it a proper run at Honda's home race in Japan the following weekend). It feels though in spite of everything that Malaysia's capacity for the unusual will likely be Merc's main threat. That perhaps too it'll need to be doing its worst. And beyond that it's the familiar tale of Lewis vs. Nico. Only more important than usual.